I’ve been having fun the last couple of days. I’m making a start on some basic decoration of my December Daily album. Primarily so I don’t have so much to do when I work on it during the month. Mostly I’m probably going to do most of the decorating and finishing touches as I put the album together after Christmas itself. If I can, I’m hoping to put pages together within a day or so of the date. But I’m not expecting that too much – it is the crazy month of December after all! Shopping, preparation, holiday organisation, food, presents……. so yes, I have a feeling the putting together will definitely end up a Post-Christmas activity! Still, it’s nice to get a start and build on my foundation pages so they aren’t so much of a blank canvas! Dec 1: Likely to have the tree and the decorations. Or at least some of them. Thursday is a busy afterschool day in our house but 1 Dec is the day I like to get the decorating started. I’ve used a Window Sheet, cut to 8×4 inches, one of the border strips from the Letters to Santa Quick Accents pack, backed it with some punched Cherry Cobbler (LOVE that colour!! 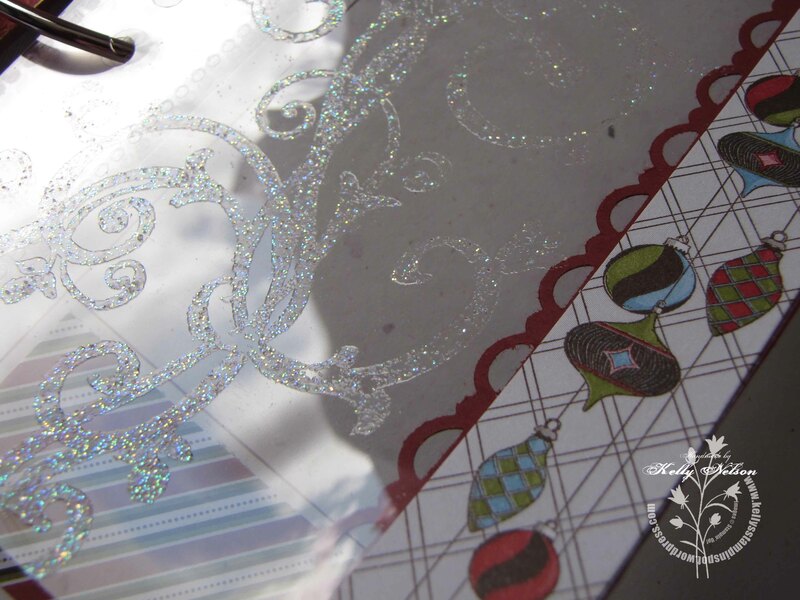 ), there’s the new large scallop circle punch on the back side, with the Silver Glimmer Paper (Summer Mini) die cut 1. The border and scallop circle were placed on the back to hide any unsightly adhesive showing through the window sheets. Oh, and you can see the inside of my cover (I’ve just realised, I’ve not downloaded the pics of the cover – I’m thrilled with out that turned out so I must do that!). 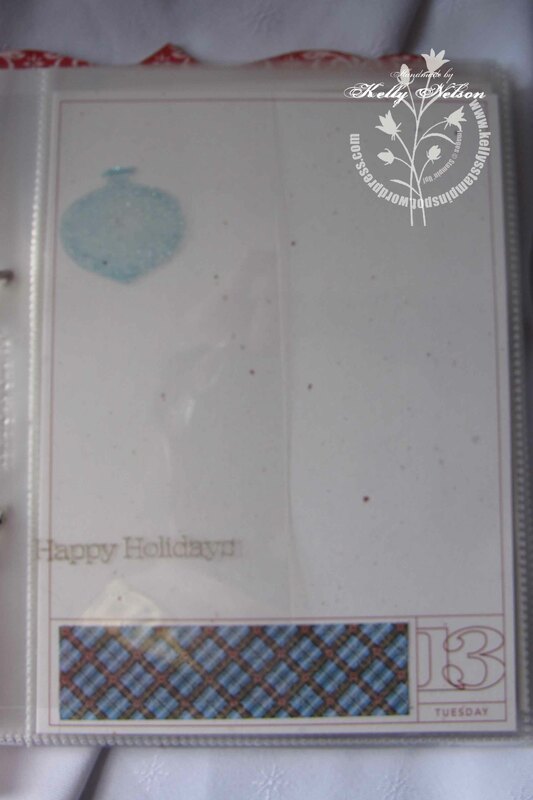 The paper I’ve used on my covers was the gorgeous flocked and embossed paper from the special DSP Christmas pack in 2010 – so that’s retired. But getting used for the first time by me just now!! Did you notice this sparkly on the Window Sheet?? I’ve heat embossed the swirl from Baroque Motifs, using Iridescent Ice embossing Powder (Summer Mini – I tell you, it’s an AWEsome mini!). Cannot tell you how thrilled I am that I can heat emboss on the Window sheets!! 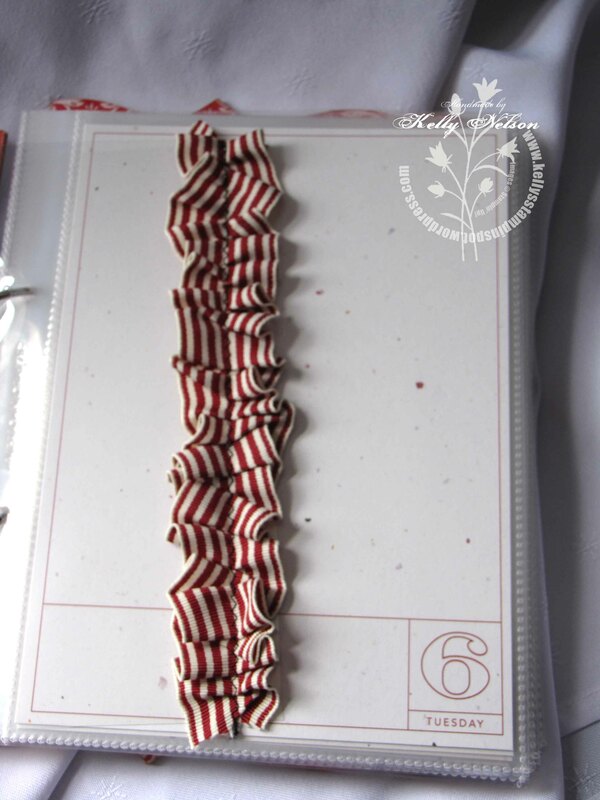 Our very wide, striped Grosgrain ribbon all ruched onto another piece of Window Sheet. I used some Sticky Strip to hold my quick ruching in place before running a line of zig-zag through the middle. I’m planning on just sprinkling the Window Sheet separators through the album as the fancy strikes me – hence no numbers or decoration beyond a bit of fabric on most of the ones I have prepared today. Now, this date I KNOW what is happening. This is the last day of term for the Mr’s. (I know – early, huh??!) So there is bound to be something going in about that. 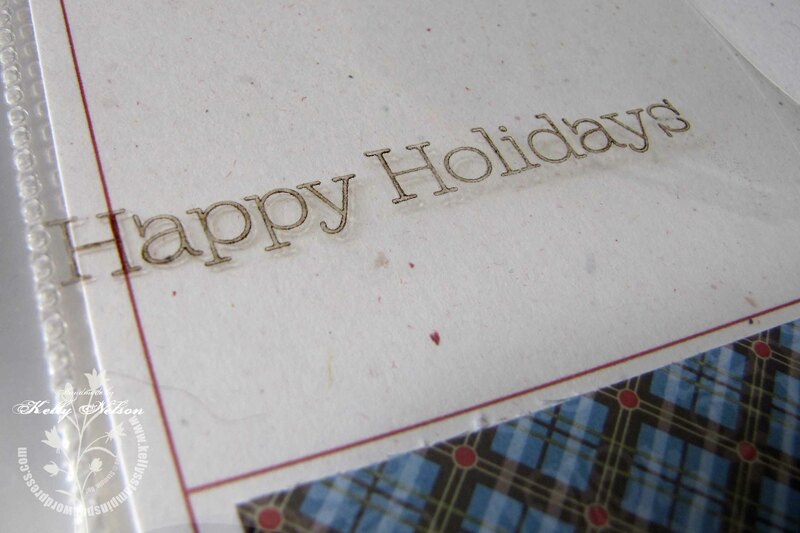 I’ve heat embossed my ornament stamp: versamark ink, Marina Mist ink, stamped the design, Iridescent Ice again. While I love to be able to emboss in any colour this way, I do notice that it creates a paler version of the original ink. I’m OK with this. “Happy Holidays” is from Many Merry Messages – but fits perfectly for the fact school hols start on this date! To get the Early Espresso on the Window sheet, I’ve heat embossed it again – but this time with just the clear embossing powder. This really lets me move beyond the Stazon white or black options! But you might see some examples of that a little later…! You might have noticed that on the bottom of the printed overlays I’ve inserted strips of DSP. 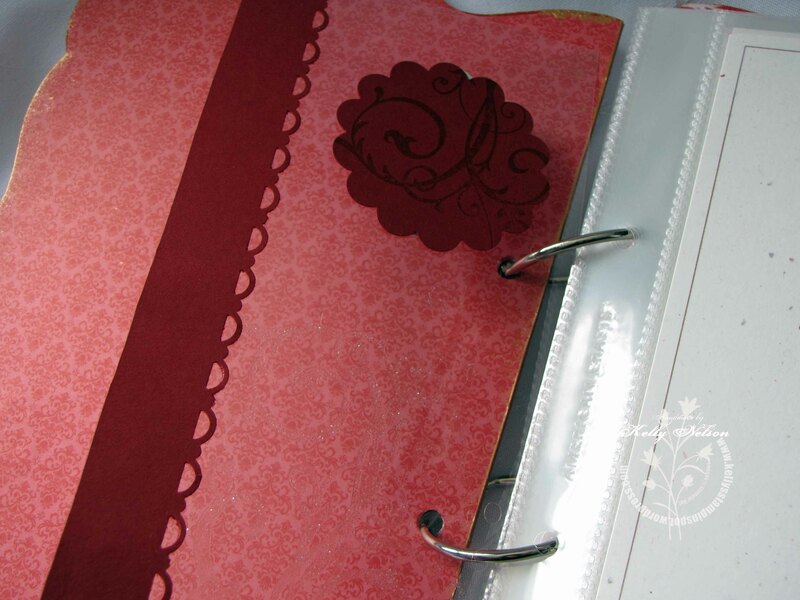 There is also a few pages with coordinating cardstock colours punched with the lacy ribbon border punch. This fits perfectly! I’ve cut or punched a bunch of those strips so that when it comes to putting it together, I can just pull out a prepared strip that will work best with the photos. I’m looking forward to showing you the end result now! You might get a few peeks as I finish further preparation 🙂 Leave a message to tell me what you think! Oh – and if you would like to order any of these products for your own December Daily, please email me your order asap. I will be placing my final order to guarantee delivery to you before Christmas on Friday 9 December. 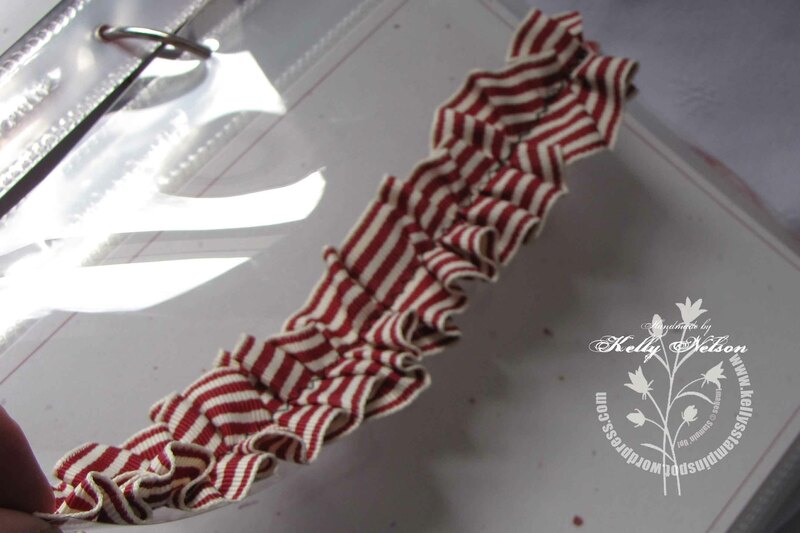 I’m in love with that ruched ribbon!!! everything looks great! Looks great, Kelly! 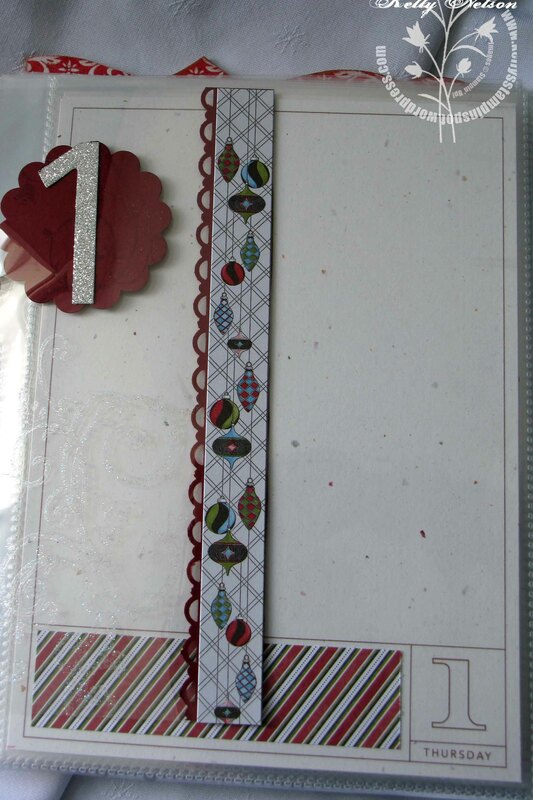 I am intending to put together my foundation sheets for Journal Your Christmas at the Crop on Saturday. Are you coming! Sadly not Margot – already had plans for that day 😦 Will miss you all – it’s been so long since I scrapped with you guys!! Have a great time – and do share your journal. You’re doing the Shimelle prompts, right? Hi Naomi, thanks for your comment! The sleeves are non-SU ones because I was using the digital overlays from Ali Edwards and these were designed as part of the kit she is using. If you go to her site, and check out the kit she is using, you will find details there. As for cover, I decided to cover some Kaisercraft wooden album covers. Would love to see yours if you decide to do an album too!